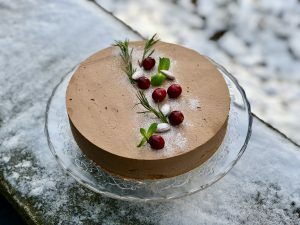 Chocolate mousse is a dessert that almost everyone likes, this is a bit of a fancier version to present it as a cake. The steps to make this cake are quite simple, it just takes some time to wait for the cake to set. In my video I’m using a cake ring, but you can totally make this in a trifle or casserole dish and serve it up like a tiramisu. I like to use semisweet chocolate for the mousse because it has the perfect amount of sweetness for me, but feel free to use dark chocolate if you like it more bitter. Whipped cream, melted chocolate, fruits, nuts, fresh herbs, etc. Preheat oven to 430ºF (220ºC). Prepare 2 pieces of parchment paper that will fit a large baking tray, on each piece of parchment draw two 7 inch/18cm circles, so you should have 4 circles total. Have your eggs separated in two bowls, egg yolks in a large one, whites in a medium bowl. With an electric hand mixer start beating your egg whites on a medium-high speed, once they get frothy add about a teaspoon of the sugar. Continue gradually adding the sugar until you’ve used up half of it (the other half is for the yolks), then continue beating on a high speed until you get stiff glossy peaks. Set the bowl aside. In the bowl of your yolks add the rest of the sugar, beat on high until pale and the sugar has dissolved (this won’t thicken as much as the whites.) Sift in the flour and add half of the whipped egg whites, gently fold those together until they are completely combined (bet gentle but thorough.) Sift in your cocoa powder and add in your remaining egg white, fold that in gently and thoroughly. In the end the mixture should be light, thick and fluffy. Pour your batter into a disposable piping bag (fit the piping bag into a large vase or jar to make filling easier.) Twist the top so you have a good grip, snip off the end and pipe circles onto the ones you have traced onto the parchment paper. You need three circles for your cake, the fourth one can be cut up and used for decoration. In a large bowl add your finely chopped chocolate and about 3/4 cup of the heavy cream, microwave for 60-90 seconds, gently whisk until smooth and set aside to cool while you whip your cream. In a separate bowl whip the res of the heavy cream with an electric hand mixer, you want soft peaks, when you lift the beaters the cream stuck on them should slightly tip down, but it shouldn’t be liquid. Add a dollop of your whipped cream to your slightly cooled melted chocolate, whisk it to get it well-combined. Add in half of your remaining whipped cream and fold it in gently to get it like 80% combined, you should still see some streaks inside. Add in the remaining whipped cream and fold that in gently yet thoroughly, you want the chocolate to be completely combined but you still want the mixture to remain light and fluffy so just be gentle. Prepare your cake ring: Place your ring on a piece of parchment paper on a tray (make sure it can fit in your freezer), place one circle of the sponge on the bottom, soak well with milk. Fit about half of your mousse in a piping bag and snip off the tip. Pipe a ring on the bottom around the gap between the sponge and the ring, make sure to fill in the edges to avoid air pockets. Pipe two more rings on top of that ring, then take a small palette knife and bring the mousse up the edges to coat the entire inside of the ring. Pipe some cream on top of the sponge as well, smooth it out as much as you can with the palette knife. Place your cake in the freezer for at least 8 hours or overnight before removing the ring. When your cake is completely frozen, remove it from the parchment paper, place the cake on top of a cup sponge side down. Warm up the sides of the ring to remove it from your cake: the easiest way to do this is with a blow torch, but if you don’t have one wait for about 10 minutes for it to defrost a bit then rub the sides with your hands to warm it up a bit. Gently slide off the ring and place the cake on your cake stand. Once your cake has defrosted you can decorate it with whipped cream, fruits, or whatever you like. Now you can finally serve! Store the cake in the fridge for up to 2 days, covered. The best way to organize making this cake is to make it 2 days in advance: on day one make the cake, day two remove cake from ring and put to defrost, then the day after enjoy. The frozen cake can be kept in the freezer for up to a month, just make sure to wrap it after it has frozen completely to avoid and strange freezer odors.